Allsville Emerging is a fictional account of a community that focusses on intentionally forming an optimal culture together that brings out the best in human beings. Transfaith spiritual principles (5) are agreed upon and practiced by the townsfolk. While Allsville Emerging takes many philosophical side trips, the main journey is told from the point of view of various fictional characters as they co-create a better world for themselves, in hopes that it will become a positive example for the larger world around them. The story of these visionaries enacting a better life together also functions as a fairly detailed manual for making an actual optimal community. Long live the Allsville! Allsville is the first in a series of books in which I hope to thoroughly contemplate the intersection of spirituality and culture. I believe that we have it in us to make our surroundings better. If we help each other grow spiritually and apply that spirituality to our collective lives by mutually shaping culture and community, we can create a world that surpasses our wildest/sweetest dreams. I am currently collaborating on a book called Be Whole Now: Psychocosmology for Fun and Prophets. One of the main ideas in Allsville Emerging is that individual minds shape culture while culture shapes individual minds, in a more or less continuous loop. What if the same principle applies to the universe or cosmos? We participate in creating the shape of the cosmos and the cosmos provides us helpful signs that shape reality in a better way. What keys to wholeness might we find if we envision a loop that extends well beyond culture, into reality itself? And how might practices to “be whole now” help us form that mind-cosmos loop? If all goes well, Be Whole Now will help people evolve toward a Non-Dual stage of understanding and living. Welcome to the world of things I see while my mind stands at the intersection of spirituality and culture. 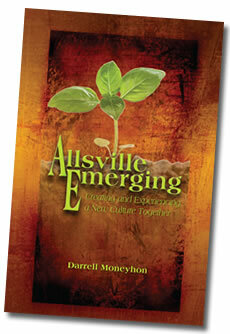 Allsville Emerging is just the beginning. Come explore the possibilities with me.